Posted on June 14, 2015 by Eric Bonnici wrote in Arts and Culture. It has 2 Comments. 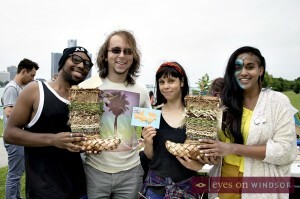 Toronto based Jumblies Theatre’s unique, cross-country intercultural arts project, Train of Thought, stopped in Windsor, Ontario on Saturday, June 13, 2015. Train of Thought travelling artists attended the Downtown Windsor Farmer’s Market in the morning. During the afternoon the group gathered at Windsor Sculpture Park. Two interesting works in progress where showcased including the Treaty Canoe and a Boot Weaving Project. This travelling community arts project is stopping at twenty locations across nine Canadian provinces. 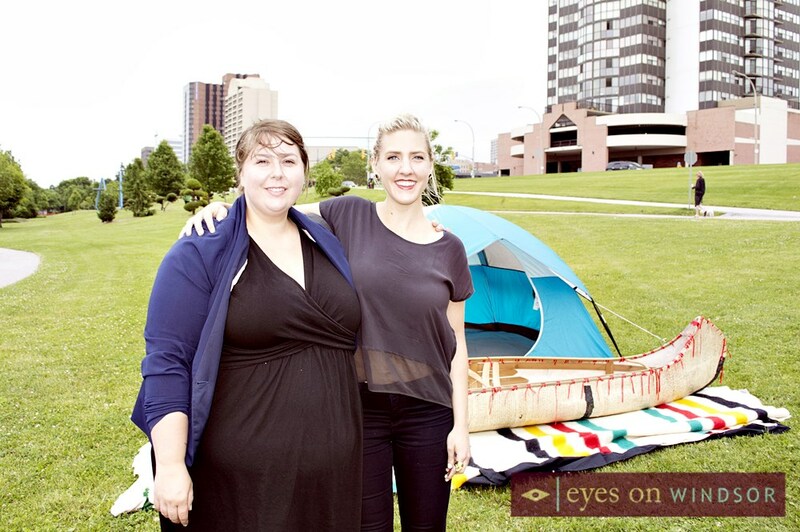 A team of travelling artists young and old are collaborating with local partners to collect and share stories and learn about Canada’s Indigenous histories and landscapes, with art-making all along the way. 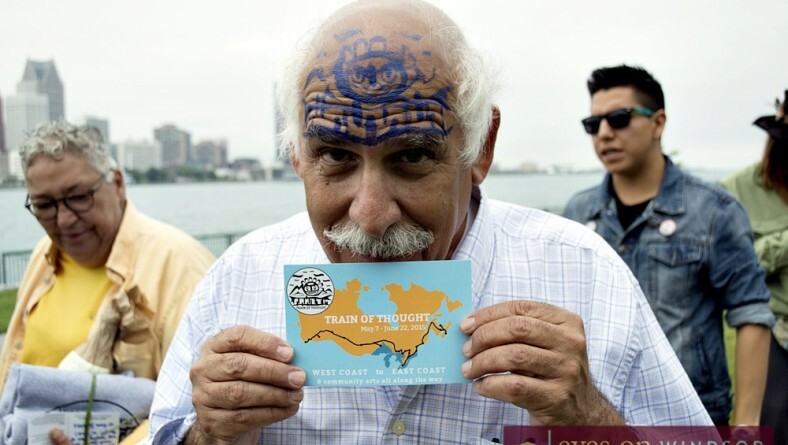 Train of Thought began it’s journey in Vancouver on May 12, 2015 and will arrive to a grand finale at the Halifax train station on June 18, 2015. 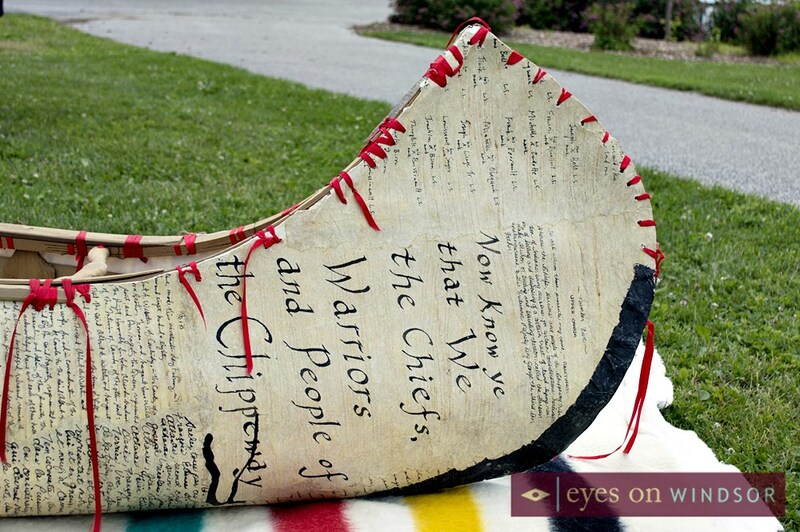 Through participatory artmaking this project is fostering reconciliation and collaboration between First Nations and settler/immigrant artists. Train of Thought artists visiting Windsor include Leah Houston, Michael Burtt, Nikki Shaffeeullah, Kate Romain and Rich Dreiger (Kate & Rich), Jason Doell, and Julia Hune-Brown. 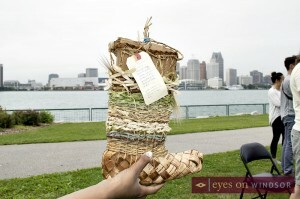 The Windsor leg of the journey was produced in partnership with local artistic organizations including the Arts Council Windsor and Region, and local artists including Nadja Pelkey, Tory James, Alex McKay, and the music duo Kate and Rich. Several interesting artistic projects were showcased during the Train of Thought afternoon art making session at the Windsor Sculpture Park. Two interesting projects included a Boot Weaving Project by Sharon Kallis and Rebecca Graham, and the Treaty Canoe led by Windsor artists Alex McKay and Tory James. Earlier in the day Train of Thought travelling artists attended the Downtown Windsor Farmer’s Market at Charles Clark Square. Local artist and musician, Theodore Hogan, attended the market as a vendor offering face painting services. 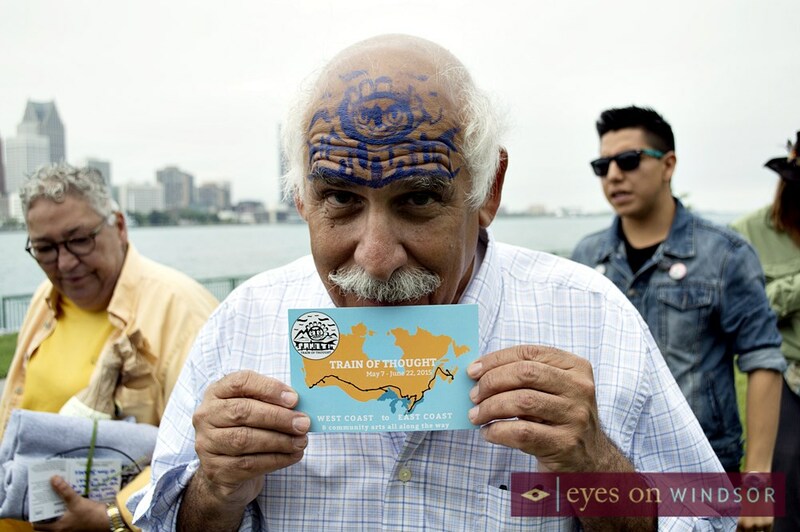 He painted the Train of Thought logo on Jumblies Theatre’s Managing Director Kieth McNair’s forehead. 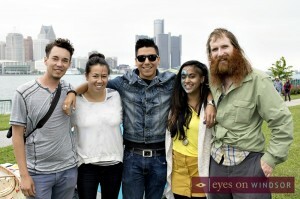 In addition, Kate & Rich performed at the Downtown Windsor Farmer’s Market with guest performer Matt Romain. Nadja Pelkey is an artist, writer and administrator living in Windsor. She was previously the program coordinator for Neighbourhood Spaces Socially Engaged and Community Based Artist in Residence, and is the interim executive director at Arts Council Windsor & Region. and mixed media artist, and Richard Driedger (from Leamington) is a filmmaking scientist. Tory James is a photographer who has worked almost every aspect of the trade, from journalism to commercial to corporate. 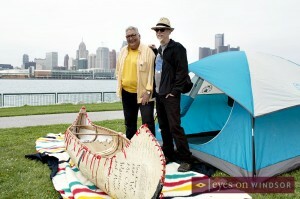 He has also sat on numerous First Nations boards, committees, and councils. He is an unapologetic activist if sometimes a contemptible spy. He once went on a three-day canoe trip with Gordon Lightfoot. 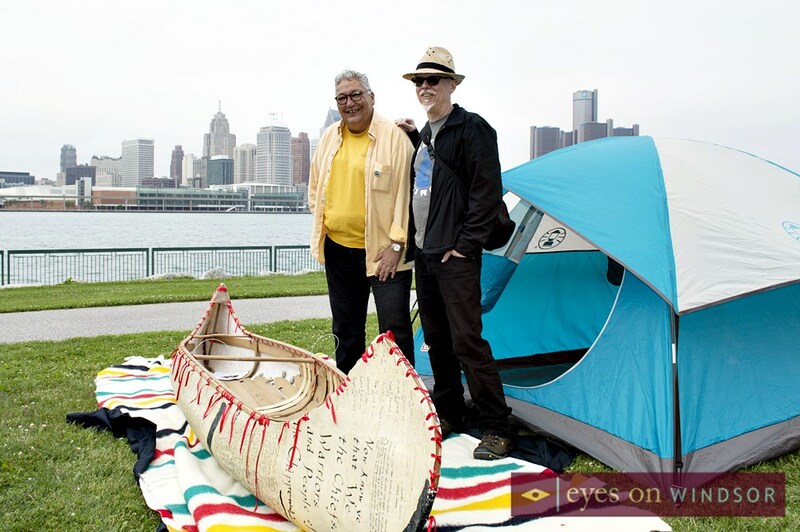 Alex McKay holds a BFA from the University of Windsor and an MFA from the School of the Art Institute of Chicago, and for over 25 years has been making work that he has described as ‘being about landscape and identity, empire and place, from a ‘post’ – or now, ‘de-colonizing perspective’. The Truth and Reconciliation Committee’s Calls to Action somehow change his work, as did the advent of Idle No More. He believes that it is Settlers who need to understand that ‘We are all Treaty People’. and connect with each other to bring something, show something and share something,” says Nadja Pelkey, Arts Council Windsor and Region. More than ninety partners across Canada are involved with Train of Thought. Partners include community organizations, artistic companies, university groups, municipal bodies, individuals, and more. Train of Thought supporters include The J.W. McConnell Family Foundation, Ontario Trillium Foundation, Canada Council for the Arts, Ontario Arts Council, Toronto Arts Council, Inspirit Foundation, Metcalf Foundation and VIA Rail.